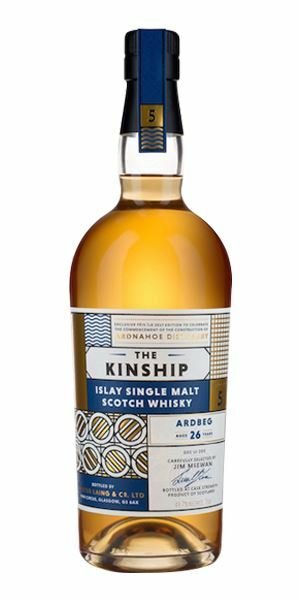 In our third and final batch of tasting notes from this year’s Islay Festival, Dave Broom examines Hunter Laing’s The Kinship, a range of six single cask Islay single malts released to mark the beginning of construction work at Ardnahoe distillery. 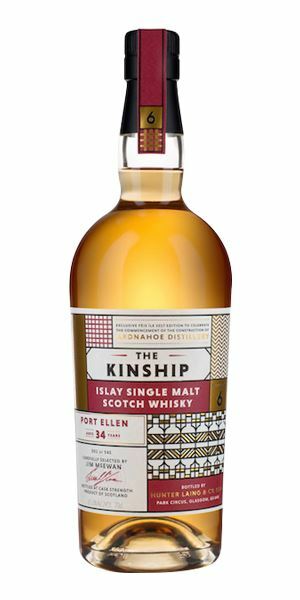 Selected by Jim McEwan, the Islay veteran who came out of retirement to become Ardnahoe’s production director, the bottlings cover five of the island’s active distilleries – Ardbeg, Bowmore, Bunnahabhain, Caol Ila and Laphroaig – plus the lost legend that is Port Ellen. One of the leaner and mossier Ardbegs, which initially brings to mind rockpools but then starts to tread inexorably into the peat bog. There is an added olive oil-like pepperiness and a whiff of salt-ruined leather boots. When water is added you get lots of burning heather. Lower than expected smoke to start, along with Hebridean smoked sea salt and dried fish. It starts to sweeten and layers begin to build. The texture is excellent, very silky and smooth and what it has lost in strength, it has gained in texture. Very sweet with a touch of smoke. A fine-boned Ardbeg whose qualities need to be approached with an open mind and a very open wallet. None of these could be called cheap. In search of silkies on the beach. Surprisingly, for a Bowmore of this age, there is hazy smoke from the start, along with some fruit and lavender before it sweetens into sponge cake, frangipani and citrus. Water pulls out a slightly yeasty, bread-like element before a burst of iodine-rich sea spray. A certain restraint here, with the smoke playing a supporting role to Parma Violet, mixed with that lavender element. It is, remarkably, still slightly tense even after this length of time. The palate is long and drying. With water, things move to more classically mature elements of argan oil, then tobacco, smoke-tinged pot-pourri and just a hint of vanilla. Like the Ardbeg, there’s a fine-boned quality to this, but the balance between the dry and the perfumed isn’t quite reconciled. An old lady puffing on a pipe. The deep mahogany colour gives you no doubt as to what to expect here. 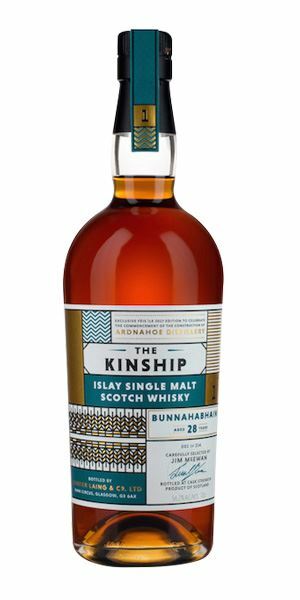 This is Bunna’ in its most robust, hefty guise. Rich, with walnut, raisin, loganberry and a sense of coiled power. There’s some black treacle, black cherry, but also a hint of struck match (that’s slightly stronger with water). The nose is just a teaser for what the palate shows. Now the full complexity emerges: soft with supple tannins, soft gingerbread studded with raisins, chocolate brownie with clove and allspice, clover honey. Deep and mature elements with added treacle. Only a drop of water is needed. Just grows in length, sweetness and complexity. An elegant old lady. A great Bunna’ and, at £310, the bargain of the range. Wearing black cherries for rings, the witch flies by. A superb, balanced, gentle nose that mingles blooming heather, smoky bacon and light seaweed elements (kelp and dulse). 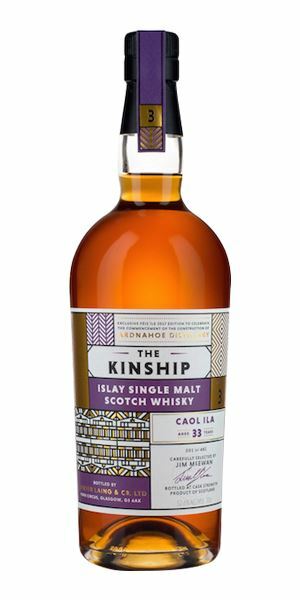 Like all great Caol Ilas, this balances the sea and the shore well. Water shows wild mint, squid ink, then Elastoplast, but without any loss of this gentle, rounded quality. Unctuous and slow to unfold. 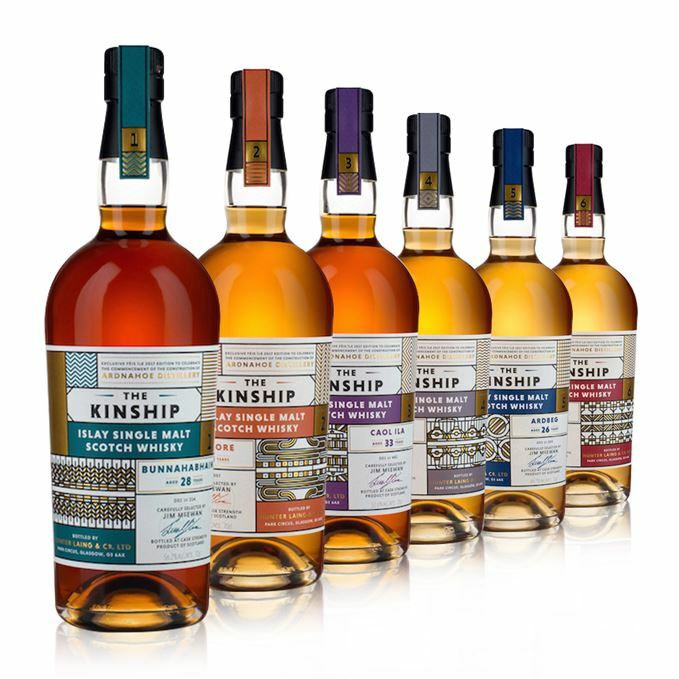 A little smoke, then juicy fruits, some balanced cask elements to kick off, before the mid-palate starts to bring them all together: cherry wood-smoked tea, chestnut, sultana, then smoked meat and sweet fruit. Water shifts the focus towards the mineral side. Oily and complex. Elegance and sophistication. The best of the range for me. Gathering for a beach barbecue. Some of Laphroaig’s giveaway pine sap elements, but added mature touches of Neoprene, cod liver oil and the soft fruits which tend to shyly emerge only after an extended time in cask. This slightly odd (but classical) mix of tar on the beach, a farm chimney and fleshy fruits continues to build. When dilute, things become increasingly creamy. Leave it for half an hour and coconut begins to dominate. …and remarkable length that mixes smoke, bog myrtle and brine. A crab fisherman with a bad cough. Hot – that strength at this age is insane. As a result it’s slightly hard to get into, there’s an old oilskin note, some medicinal elements and dry, seashore-accented smoke. Water brings out lemon acidity and more overt smoke. Distinctly salty and slightly hard as the alcohol dominates. It has this slightly desperate air to it: there’s a raging storm battering at the windows as you sit down to a seafood feast of spaghetti alle vongole with samphire, and sashimi with wasabi. Water is needed and, while it makes things slightly more accessible, it also dries and a starchy austerity takes over. It might sound daft, but I’d have loved to have seen this in another 10 years.